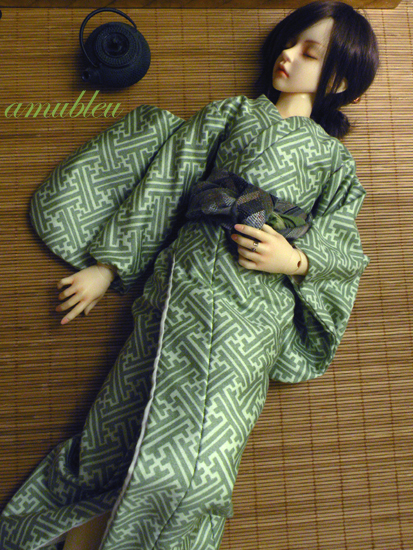 This is one of the lovely doll items I picked up at Nekocon this past weekend. Tiffany of leveldevil was in the artist alley selling her lovely doll clothing. I had purchased a wig from her this past otakon and was so happy to see her this time around. She had this lovely kimono on display and when I saw the quality and what she was asking for it I had to get it for one of my boys. It’s completely lined and it looks to be hand stitched which is how classic human sized kimono are made (some know how crazy I am about details like that). It fits Hito so nicely. I usually have issues with the length. It’s longer since I think it maybe made more for a long leg volks (I will have to ask. Hito in on a normal leg body, btw) but it’s perfect.